The PRS 2017 SE Zach Myers signature electric guitar is the result of a closely worked collaboration between the "Shinedown" guitarist and PRS. Picking up a Custom 22 at the age of fifteen, Myers' love affair with PRS began and his first SE signature model was released in 2010 and each rendition has gone from strength to strength. The single-cutaway, semi-hollow body is crafted from mahogany back and sides, married to a bevelled maple top with flame maple veneer. The semi-hollow design is accentuated with an F-hole towards the lower bout. Everything about this body design is geared towards allowing the tonewoods to resonate as fully as possible. The mahogany creates a swelling low-end, whilst the maple cuts through with a distinct clarity through the mids and highs. Thanks to the semi-hollow design, this guitar is a pleasure to wield onstage making it a true performer's instrument. Whether it's practising at home alone or playing a 3-hour set in front of thousands, the Zach Myers' signature offers incredible comfortability. Fitted to the body is a solid mahogany neck, shaped to the substantial wide-fat profile. The neck offers a reassuring feel in the hand, with a generous scale length of 24.5" for the strings to resonate along. Not along that but the profile makes playing a breeze, with plenty of space to comfortably plant fingers without ever having to overstretch. Married to the neck is a sumptuous rosewood fingerboard, home to 22 inviting frets that are adorned with the customary PRS bird inlays to guide your way. The PRS Designed SE245 humbuckers in the neck and bridge positions allow you to draw upon a huge range of tones to explore your own sonic universe. Each pickup has its own individual volume and tone control, allowing you to shape and sculpt your tone exactly how you want. The SE 245 is not a one-trick pony, and in a short space of time you'll quickly find yourself navigating between funk/jazz/country/rock/metal tones with the greatest of ease. The Zach Myers' signature model is fitted with the PRS Adjustable Stoptail, which provides a seamless connection between the strings and body. The headstock is fitted with vintage style tuners to keep your tuning secure no matter how enthusiastically you play. The tuners compliment the outstanding vintage sunburst body finish perfectly, as well as the natural finish on the headstock. 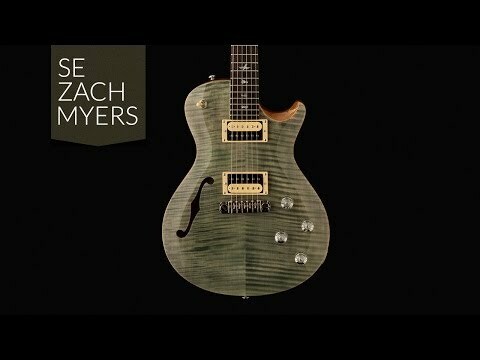 It is clear to see that the PRS 2017 SE Zach Myers' signature model has been built to the specs set out by a touring guitarist. Everything has been deftly selected in order to make this guitar beautiful; from the way it feels, to how it hangs when you play, how it sounds and most of all, how everything compliments the sublime body finish. This special guitar is set to become a firm favourite, don't miss out on your chance and grab one whilst you can.